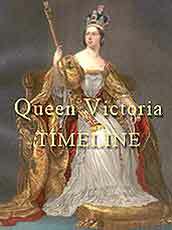 The coronation for Queen Victoria was held on Thursday, the 28th of June, in 1838. It was a festive day for England when Queen Victoria went forth from her palace to the coronation, and thousands and tens of thousands of her delighted and affectionate subjects thronged the streets along which the procession passed; at an early hour all London seemed to be alive and long before the time appointed for the procession to move, the platforms and balconies in the line were crowded with persons, among whom numbers of beautiful and richly-dressed ladies were conspicuous, exacting the silent homage of all beholders. 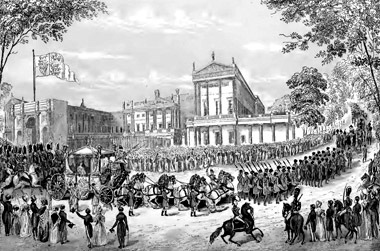 At ten o'clock, the procession left the palace and proceeded up Constitution Hill, from the top of which Her Majesty was able to observe the preparations for the fair which was to be held in Hyde Park. The procession passed along Piccadilly, whilst the liveliest demonstrations of affection fell upon Her Majesty's ears. The merry pealing of the bells and the shouts of the rejoicing people were exhilarating and truly delightful. From Piccadilly the procession passed into St. James's Street and Pall Mall, the balconies of the club-houses were thronged with elegantly dressed ladies, and others, cheering and waving their handkerchiefs. The procession then moved along Parliament Street to the Abbey, the approaches to which were lined with covered platforms, almost every seat in which was occupied. 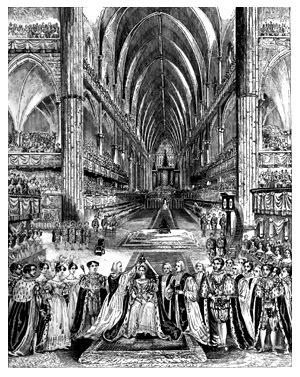 The Peers and Peeresses, in their robes of estate, and others, summoned by her Majesty’s command to witness the ceremony of the coronation, were conducted to the places assigned to them in Westminster Abbey previously to the arrival of her Majesty. Arrival at the Abbey — On the arrival of the procession at the west entrance to the Abbey Her Majesty was received by the great Officers of State, the Noblemen bearing the Regalia, and the Bishops carrying the Patina, the Chalice, and the Bible, when Her Majesty repaired to her robing-chamber, constructed on the right of the platform without the entrance. In front of the grand western entrance to the Abbey, a beautiful Gothic edifice was erected, the style of architecture being perfectly in accordance with the antiquity of the Abbey itself. On entering the porch of this edifice, the same Gothic character was found to be beautifully preserved. 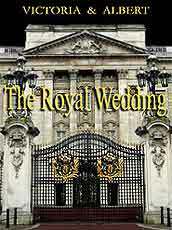 On the right and left of the porch were the reception-rooms of Her Majesty and the members of the Royal Family. These chambers were entered through oaken doors, beautifully carved; that on the right was set apart for Her Majesty, and was entered through an anti-chamber, in which her attendants remained. The walls of Her Majesty's chamber were covered with crimson paper, with Gothic panels and cornices, and lighted by two windows. From this chamber a Gothic-arched door led to a retiring room. The furniture of this room was all of oak, beautifully carved and gilt; and the hangings, carpets, and other fitments, all preserved the same appearance of antiquity. Her Majesty, having been robed, then advanced up the nave into the choir; the choristers in the orchestra singing the anthem, "I was glad when they said unto me; we will go into the house of the Lord." The Naive — Over the naive a substantial flooring had been placed, while, over the side aisles, galleries were erected for the accommodation of 1,500 persons. These galleries were fitted up with seats, amphitheatrically arranged, covered with crimson cloth, the fronts being decorated with crimson drapery and gold trimming; and, still to preserve the illusion and completeness of this part of the edifice, canvass screens reached from the bottom of the galleries to the floor, which were beautifully painted in imitation of masonry. Looking forward towards the choir or theatre, a splendid Gothic screen, within which is the organ loft and musicians' gallery, met the eye, assuming all the appearance of solid masonry, and displaying niches in which various figures appeared supported by arches and other architectural accompaniments. Under this screen and supporting the music gallery, were a succession of Gothic pillars, which formed a sort of vestibule, through which the procession passed. The Theatre — Here the full blaze of the magnificent decorations in the interior of the Abbey filled the mind with astonishment. In front was the altar with its splendid Gothic canopy and gorgeous tracery, before which the principal ceremonies took place; and still nearer was the chair and platform on which Her Majesty received the homage of the Peers. Above the altar was the gallery for the reception of the members of the House of Commons; and above this again an additional gallery had been added, in front of which the arms of her Majesty were beautifully emblazoned. On the right and left, at a vast altitude, were galleries for the accommodation of those who had obtained tickets; while on each side of the platform were the seats of the Peers and Peeresses, with those for their immediate friends behind. In the choir were other seats the fronts of which were ornamented with gilt perforated Gothic panels, the lower part being formed of wainscot panels. Above these, again were galleries, the upper ones stretching some distance into the naive. The Music Gallery — Over the entrance to the theatre from the naive was a magnificent music gallery, containing at the extreme end the organ with its Gothic case of wainscot and gold. The galleries throughout were covered with crimson cloth with gold fringe, the panels of wainscot and gold, the tout ensemble presenting a scene of gorgeous magnificence. Chalice, and the Patina, stood near the pulpit, and the Train-bearers, the Lord Chamberlain of the Household, and the Groom of the Robes, behind Her Majesty. The Recognition — Upon the conclusion of the Anthem, the Archbishop of Canterbury advanced from his station at the south-east pillar, and, together with the Lord Chancellor, the Lord Great Chamberlain, the Lord High Constable, and the Earl Marshal, preceded by Deputy Garter, moved to the east side of the theatre where the archbishop made the Recognition. After, the trumpets sounded and the drums beat. Her Majesty then resumed her seat. The Officers of the Wardrobe having spread a rich cloth of gold, and laid a cushion on the same for her Majesty to kneel on, at the steps of the altar, the Archbishop of Canterbury proceeded to the altar and put on his cope. The First Offering — The Queen, attended by the two Bishops, her supporters, and the Dean of Westminster, the Great Officers, and the Noblemen bearing the Regalia and the Four Swords going before Her Majesty, then passed to the altar. Her Majesty, kneeling upon the cushion, made her first offering of a pall or altar cloth of cold. The Treasurer of the Household then delivered an ingot of gold, of one pound weight, to the Lord Great Chamberlain, who having presented the same to the Queen; Her Majesty delivered it to the Archbishop, to be by him put into the Oblation Basin. At the conclusion of the prayer her Majesty rose and went attended as before to the Chair of State on the south side of the area. The Litany was then read by the Bishops of Worcester and St. David's kneeling at a faldstool above the steps of the theatre, in the centre of the east side thereof, the choir reading the responses. The Communion Service — The choir having sung the Sanctus — "Holy! Holy! Holy! Lord God of Hosts!" the Archbishop begun the service, the Bishop of Rochester reading the Epistle, and the Bishop of Carlisle the Gospel. The Sermon was then preached by the Bishop of London. During the sermon her Majesty continued to sit in her chair on the south side of the area, opposite the pulpit, supported on her right hand by the Bishop of Durham, and beyond him, on the same side, were the Noblemen carrying the swords ; on her left the Bishop of Bath and Wells, and near him the Lord Great Chamberlain. The Oath — The sermon being concluded the Archbishop of Canterbury, advancing towards the Queen and standing before her, ministered the questions prescribed by the service; which having been answered by her Majesty, she arose from her chair, and, attended by her supporters and the Lord Great Chamberlain — the sword of state alone being borne before her Majesty — went to the altar, where, kneeling upon the cushion placed on the steps, and laying her right hand on the Holy Gospels, tendered to her Majesty by the Archbishop, she took the Coronation Oath, kissed the book, and to a transcript of the oath set her Royal sign manual, the Lord Chamberlain of the Household holding a silver standish for that purpose, delivered to him by an officer of the Jewel Office. The Queen then returning to her chair, a hymn was sung by the choir, the Archbishop reading the first line, "Come, Holy Ghost, our souls inspire." The Anointing — Upon the conclusion of the hymn the Archbishop read the prayer preparatory to the anointing, "O Lord, Holy Father, who by anointing with oil, didst of old make and consecrate Kings, Priests, and Prophets," &c. At the commencement of the anthem the Queen arose from her chair, went before the altar, and, attended by her supporters and the Lord Great Chamberlain, the Sword of State being borne before her, was disrobed of her crimson robe by the Mistress of the Robes. The Queen then proceeded to and sat down in St. Edward's chair, covered with cloth of gold, and with a faldstool before it, placed in front of the altar, when her Majesty was anointed; four Knights of the Garter holding over the Queen's head a rich pall or cloth of gold. The anthem being concluded, the Dean of Westminster took from the altar the ampulla containing the consecrated oil, and, pouring some into the anointing spoon, the Archbishop anointed her Majesty on the head and hands, in the form of a cross, pronouncing the words, "Be thou anointed," &c. The Queen then kneeling at her faldstool, the Archbishop, standing on the north side of the altar, pronounced the prayer after the anointing; when her Majesty, arising, resumed her seat in St. Edward's chair. Other Ceremonies — After this, the Dean took the spurs from the altar, and delivered them to the Lord Great Chamberlain, who, kneeling down, presented them to her Majesty, who returned them, to be laid upon the altar. The Viscount Melbourne, carrying the sword of state, delivered it to the Lord Chamberlain, and, in lieu thereof, received from him another sword in a scabbard of purple velvet, which his Lordship re-delivered to the Archbishop, who laid it on the altar, and said the prayer, "Hear our prayers, O Lord, we beseech thee, and so direct and support thy servant, Queen Victoria,'' &c. The Archbishop then took the sword from off the altar, and, assisted by the Archbishops of York and Armagh, with the Bishops of London, Winchester, and other Bishops, delivered the sword into the Queen's right hand, saying, "Receive this kingly sword," &c. The Queen, rising up, went to the altar, where her Majesty offered the sword in the scabbard (delivering it to the Archbishop, who placed it on the altar), and then returning to St. Edward's chair, the sword was redeemed for one hundred shillings by Viscount Melbourne. The Queen then standing, her Majesty was invested by the Dean with the imperial mantle, or dalmatic robe of cloth gold, delivered to him by the officer of the wardrobe, the Lord Great Chancellor fastening the clasps. The Queen sitting down, the Archbishop having received the orb from the Dean, delivered it into the Queen's right hand, saying, "Receive this imperial robe and orb," &c. Her Majesty returned the orb to the Dean, who laid it on the altar. The Lord Chamberlain of her Majesty's Household then, receiving from the officer of the Jewel Office the ruby ring, delivered the same to the Archbishop, who put it on the fourth finger of the Queen's right hand, saying, "Receive this ring," &c. The Dean then brought from the altar the scepter with the cross and the scepter with the dove, and delivered them to the Archbishop. In the meantime the Duke of Norfolk, as Lord of the Manor of Worksop, had left his seat, and, approaching the Queen, kneeling, presented to her Majesty a glove for her right hand, embroidered with the arms of Howard, which her Majesty put on. The Archbishop then delivered the Scepter with the Cross into her Majesty's right hand, saying, "Receive the Royal Scepter," &c. ; and then the Scepter with the Dove into her left hand, saying, "Receive the Rod of Equity," &c.
The Crowning — The Archbishop standing before the altar, and having St. Edward's Crown before him, took the same into his hands, and consecrated and blessed it with the prayer, "O God who crownest thy faithful servants with mercy," &c. Then the Archbishop came from the altar, assisted by the Archbishops of York and Armagh, with the Bishops of London, Winchester, and other Bishops, the Dean of Westminster carrying the Crown; the Archbishop took and placed it on her Majesty's head; when the assemblage with loud and repeated shouts cried, "God Save the Queen" and immediately the Peers and Peeresses put on their Coronets, the Bishops their caps, and the Kings of Arms their crowns; the trumpets sounding, the drums beating, and the Tower and Park guns firing by signal. The acclamation ceasing, the Archbishop pronounced the exhortation, "Be strong and of good courage," &c. The choir then sung the following anthem, "The Queen shall rejoice," &c. The Archbishop having pronounced the benediction, the Te Deum was sung by the choir, at the commencement of which the Queen removed to the recognition chair on which her Majesty first sat. The Enthronization — Te Deum being ended, the Queen ascended the theatre, and was assisted into her Throne by the Archbishop, Bishops, and Peers around her Majesty, and, being so enthroned, all the great Officers of State, the Noblemen bearing the Swords, and the Noblemen who had borne the other Regalia, stood around about the steps of the Throne, when the Archbishop, standing before the Queen, pronounced the exhortation, "Stand firm and hold fast," &c.
The Homage — The Archbishop then knelt before the Queen, and, for himself and the other Lords Spiritual, pronounced the words of Homage, they kneeling around him, and saying after him. The Archbishop then kissed her Majesty's hand, and the rest of the Lords Spiritual did the same, and then retired. The Dukes of Sussex and Cambridge (the illustrious uncles of our Queen Victoria), ascending the steps of the Throne, and taking off their coronets, knelt before the Queen; and the Duke of Sussex pronounced the words of homage, the Duke of Cambridge saying after him. Their Royal Highnesses then severally touched the Crown upon her Majesty's head, and kissed her Majesty's left cheek; they then retired. The Dukes and other Peers thereupon performed their homage, the senior of each degree pronouncing the words of homage, and the rest of the same degree saying after him, and each Peer of the same degree, successively, touching her Majesty's Crown, and kissing her Majesty's hand, and then retiring. During the performance of the homage the choir sung the anthem, "This is the day which the Lord hath made," &c., and the Treasurer of her Majesty's Household threw about the medals of the Coronation. The Holy Sacrament — After the anthem the Bishops of Carlisle and Rochester, who had read the Epistle and Gospel, received from the altar, by the hands of the Archbishop, the patina and the chalice, which they carried into St. Edward's Chapel, and brought from thence the bread upon the patina, and the wine in the chalice. 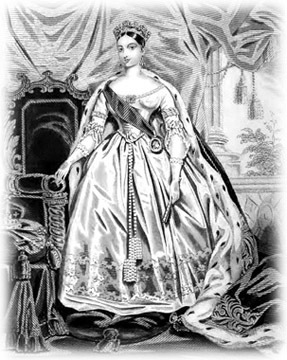 Her Majesty then delivered the scepters to the Dukes of Norfolk and Richmond, and descending from her Throne, attended by her supporters, and assisted by the Lord Great Chamberlain, the Sword of State being borne before her, went to the altar, and, taking off her Crown, delivered it to the Lord Great Chamberlain to hold. She then knelt down, and received the sacrament. The Second Offering, which was a purse of gold, was then made. The Queen afterwards received the Crown from the Lord Great Chamberlain, and put it on, and repaired to her throne, receiving again the scepter with the cross in her right hand, and the scepter with the dove in her left, being there supported and attended as during the enthronization. The service being concluded, her Majesty, attended by the two Bishops, her supporters, the Great Officers of State, the Noblemen bearing the four swords before her, and the Noblemen who had carried the regalia then lying upon the altar, descended into the area, and passed through the door on the south side into St. Edward's Chapel, where her Majesty was disrobed of her Royal Imperial Mantle or Robe of State, and arrayed in her Royal robe of purple velvet, by the Lord Great Chamberlain. Her Majesty then proceeded out of the choir, and to the west door of the Abbey, the Queen wearing her Crown, and bearing in her right hand the scepter with the cross, and in her left the orb; their Royal Highnesses the Princes and Princesses wearing their coronets. The procession was again formed, and her Majesty commenced her return to Buckingham Palace. 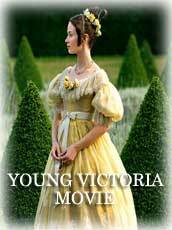 Immediately that the Queen was observed to emerge from the Abbey, the acclamations of the populace rent the air; and these shouts of joy seemed to have a great effect upon her Majesty, who was evidently suffering much from the fatigue which she had undergone. 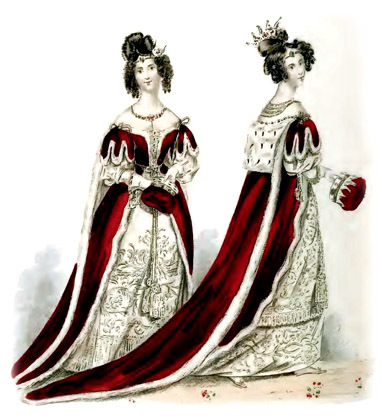 The Dalmatic Robe, in which her Majesty was crowned, is nine yards in length; the ground or warp is of the richest gold colored silk, and the shoot consists of gold and silver twist, and rich silks of various shades. The principal surface appears to be massive gold, and the figures, which are bold and considerably raised, are of the most magnificent description. Those of the regal crown, the rose, the shamrock, and the thistle, are truly beautiful. The eagle, the fleur-de-lis, and other foreign national emblems, are also very prominent and beautifully executed, and do infinite credit to the skill, taste, and judgment of the manufacturer. The Queen's Under-Dress was composed of rich white satin of gold brocade. 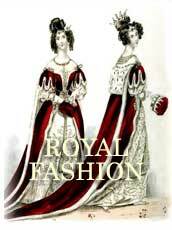 The Duchess of Kent wore a similar dress, but of a different pattern. 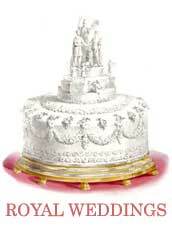 The Gold Palls which her Majesty offered at the altar were splendid pieces of workmanship. The first was composed of silk, with barred gold ground, and gold brocaded flowers; the second with silver brocade flowers, and both were lined with silver plated tabby. The Back Piece of the Altar and Pulpit Cloth were of purple silk, with gold and silver tissue. The Carpet for the Throne was composed of a gold barred ground, with rose-colored silk brocade. The Hangings of the Abbey were composed of six hundred yards of rich purple satin, brocaded with gold-colored silk flowers.